Non-toxic, water-based POSCA paint markers can be used on almost any surface, and are loved by professionals, creative hobbyists and amateurs alike. The alcohol and solvent-free opaque paint covers well, is blendable, dries quickly and can be overlaid when dry. ACMI certified and made in Japan. Permanent when dry on most surfaces. Can be used on fabric but may not stand up to washing. 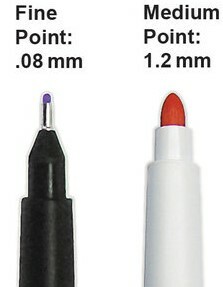 The PCF-350 brush tip marker combines the advantages of a paintbrush with the benefits of a pen. With its soft tip, it can be used for hard to reach areas, and it allows everyone the experience and the pleasure of painting without having to buy paint and paint burshes.